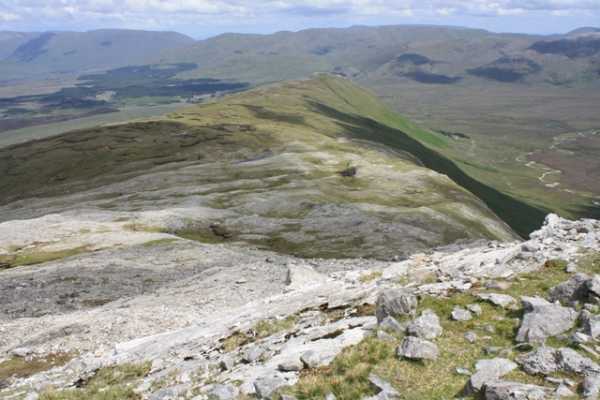 Knockpasheemore (Binn Charrach) is a small summit at the end of a 2km ridge heading NE from the lower scree slopes of Benbaun, and makes a worthwhile climb either in its own right, or as a diversion on the way to Benbaun. While it can be approached, across blanket bog and up steep grassy slopes, from the Glencorbet Valley to the north (ample parking just after the bridge at L799574 A) that route is most often used to head up Benbaun, bypassing the Knockpasheemore summit in the process. The most direct route to Knockpasheemore is to park to the east at L81226 56960 B where there is a lay-by with parking for 3-4 cars. A sturdy fence can be overcome by following it to the NW for a few minutes where it ends.